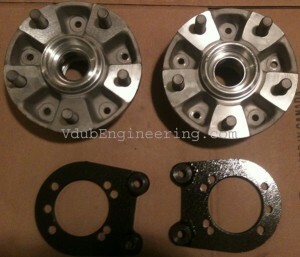 This kit adapts 83-85 944 NA hubs and disks (front mount) to a BJ/Super/Thing spindle. Since the 944 bearings are larger than the stock beetle, bearing spacers are employed to make the hub fit onto the T1 spindle. The spacers are a shrink-fit onto the944 hub and machined for beetle bearings/seals. No spindle mods are required for the caliper bracket. Offset increase is +13mm per side. 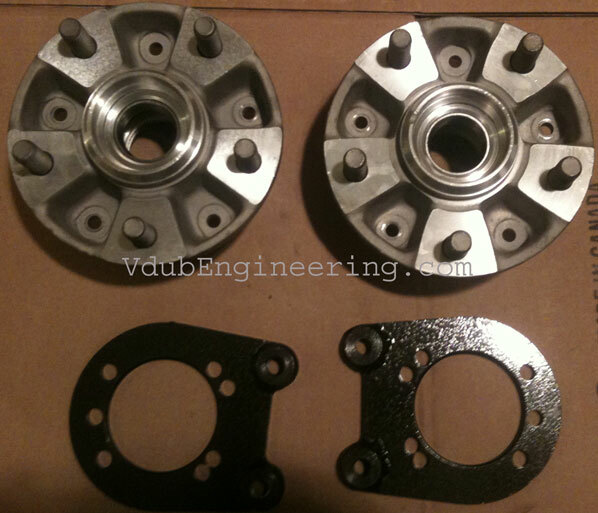 Please send YOUR core hubs to VdubEngineering for machining. They will be returned with machined and ready to go, with bearing races installed, bearings/seals provided (Made in Germany), caliper brackets, hardware and instructions. The machining take about 4-8 weeks, but please inquire for current turnaround estimates. Your will require the use of 83-84 944NA rotors and calipers (not included).